I've been postponing my sweet bakes for some time now.No prizes for guessing it is related to the dreaded weighing scale:).My new love for Yeast baking is also a culprit.The inspiration came from a magazine,I was reading an article on a birthday cake and tada!the bulb shines and I HAD to bake a cake.There are a few recipes which are in my head and doesn't need a double check,but I was in the mood for something new. When I bit into the slice,I wondered whether I was a chocoholic or not because this cake is so full of vanilla flavor that no matter what,you'll end up falling in love with it.The secret ingredient to achieving the lovely yellow colour is Custard powder.I have used the same in few recipes before,here and here.I yearn to achieve bakery-like results in my baking since I have no other benchmark and I must say this one fits the bill perfectly. Preheat oven to 180C.Grease and line a 9' round cake tin. 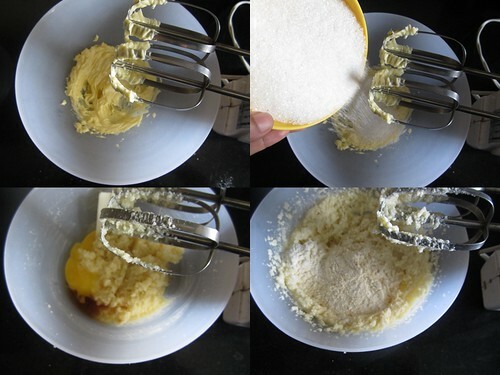 In a big mixing bowl cream together butter and sugar till light and fluffy.Mix in the eggs and vanilla and beat again. Slowly add the dry ingredients followed by milk and beat till you get a smooth batter. 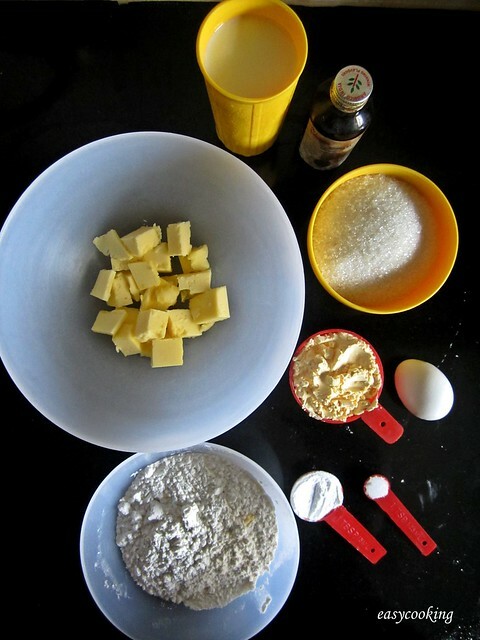 *I had used a small mixing bowl and didn't want flour to fly everywhere on my counter top,so followed the usual way of adding dry ingredients with wet ingredients alternately into the batter. Pour the batter into the prepared tin and bake for 40-45 minutes or till a toothpick inserted into the center of the cake comes out clean. Cool in the tin for 5-7 minutes,then invert into a wire rack to cool completely. The cake tastes best served warm,plain or dusted with some powdered sugar.Of course,it would be delicious if you fill and frost it using vanilla flavored buttercream or even sweetened whipped cream with fresh fruits.Endless possibilities. Ah! I love this cake. I have baked it not so long ago and whoever ate it loved it! The slices look so inviting. Wow look at the texture so so love it...Tempting cake! 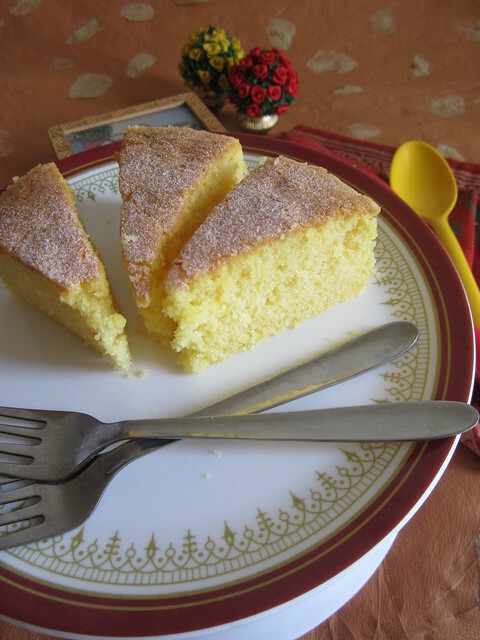 Super spongy cake, beautifully done..
Looks wonderful.Perfect and moist. I am not much of a baking person but do admire them when made. I came across your blog while searching for some ways to bake with my LG convection microwave. I am a newbie to cooking. I love your easy illustrations. very helpful. ALso, wanted to know if any video is available on youtube on baking in a M/W with convection mode. Love your blog and i am going to try some of your recepies and will let you know how it goes. Im no expert at eggless baking but I know that many people use potato starch/ farina as a substiture but Im not sure of the quantities. Hi Meenakshi,thank you for your encouraging words.Check out egglessbaking.com for eggless baking recipes as well as egg substitutes.Hope it helps! No, no ... such cakes should be eaten plain - and I would love to have that slice right now! this looks fab! Im new to your blog so just a quick q...the baking tin you used? What is it made of? You made this in the convection oven right? Beautiful spongy and delicious cake..vanilla is my daughter's choice always while I am a little double-minded and sometimes find it a little hard to decide whether its going to be chocolate or vanilla. 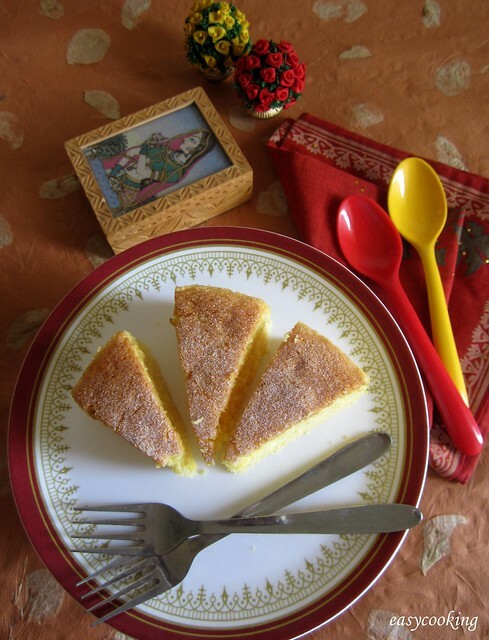 Nice simple bake..I make a similar vanilla cake..but the addition of custard powder is new..will try it. 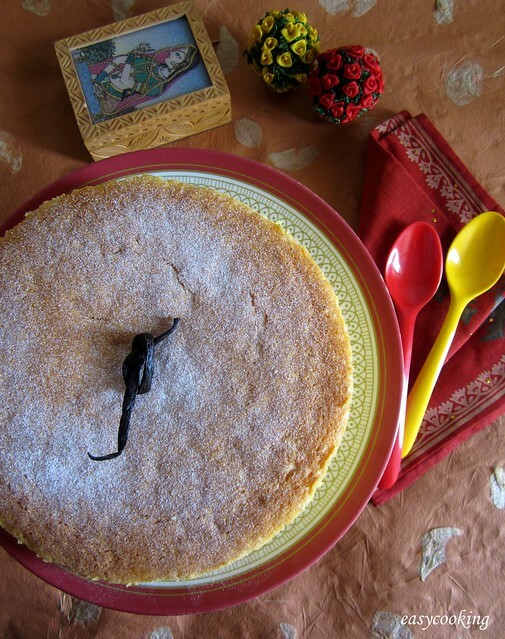 I love your blog and keep trying your Konkani and baking recipes. Great going! Baked this cake - however it turned out slightly bitter and on the salty side. What would be the minimum baking powder required for a cake of this size ? Thanks Shruti,I am not sure why it turned bitter,probably the baking powder-is it fresh?Did you use salted butter? Usually for 1 cup of flour,you'd need 1 tsp of baking powder.That is a generic amount though-it differs from cake to cake depending on the amount of eggs,baking soda etc. 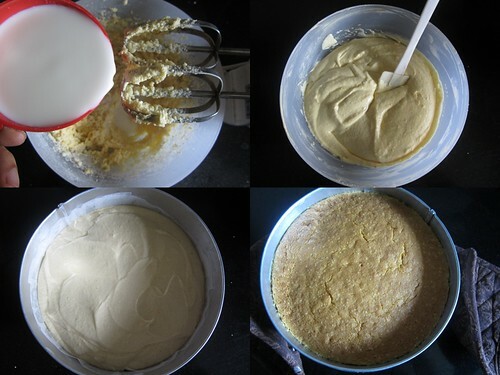 I hope you try this cake again with great results! Hi Divya, thanks for that tip. I had used unsalted butter and within warranty baking powder. Maybe I will just reduce those 2 elements a little the next time and try again ! I tried this cake today. I baked it in microwave for 30 mins at 180C. The top started turning really dark brown and i smelt a lil burning smell so stopped the baking. However the cake was not cooked at the bottom. What can i do to prevent over browning. I have read about covering it with aluminium foil. But can i use foil in microwave? If the cake started browning on top too soon,the temperature may be too high.Each oven is different so maybe your oven needs a lower temperature.Yes you can use a foil as long as it is secured and do not touch the sides and top of the mw. Just stumbled on to your beautiful blog and it feels like I've found a friend I desperately needed. Lovely pictures, and very helpful and detailed instructions. Thank you so much for this. This cake looks delicious, and quite fuss-free too! Good thing for a newbie like me. :-) Just wanted to ask, have you used unsalted butter or is it your everyday Amul butter (or a less illustrious cousin, perhaps)?